Buy the Farm . 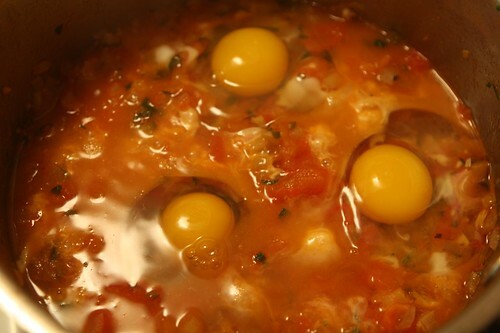 . . Share: Shakshuka! 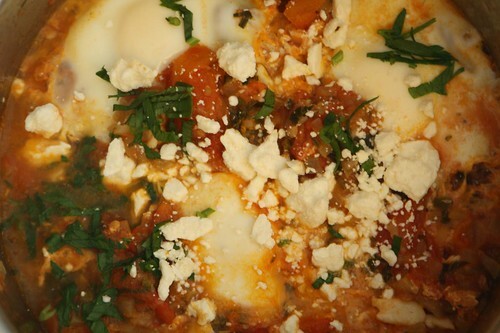 When most people hear the term shakshuka they don't often think of the Israeli dish. They usually mistake this for the 1994 Shaquille O'Neal vehicle, Shaq Shuka!. In this film Shak Shuka (O'Neal) plays a sleeping genie who is awoken by a group or children who discover that if you polish a lantern and say "Shaq Shuka!" three times, a giant, ridiculously dresed genie will come out of the lantern and play a basketball with you. While a commercial failure this film did have one memorable scene where Shaq Shuka (O'Neal) teaches the kids how to make his famous shakshuka dish which had been shown to him by his Israeli grandmother. I really don't know why this film didn't become a cult hit. It holds up surprisingly well. I decided I wanted to make Shaquille O'Neal's signature dish so I started off by sauteeing crushed garlic, farm Wala Wala onions (the only kind of onions to use in this dish), farm lilac peppers, and farm serrano chilies in some olive oil. Then I did a quick concasse of some of the farm tomatoes, removing their skin and seeds, and crushed them by hand into the pot, cooking the combination down for 30-40 minutes. After a few minutes I added some smoked paprika and cumin, cooked for a while longer, then cracked a few eggs into the pot to allow them to poach. 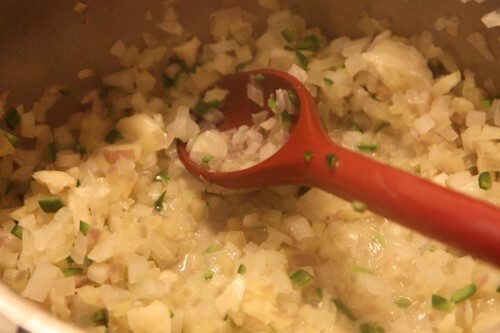 I served the whole dish up with some crumbled feta and chopped parsley, and fresh Italian bread for dipping. When doing a simple Google search for what beer to pair with shakshuka I came up surprisingly empty. 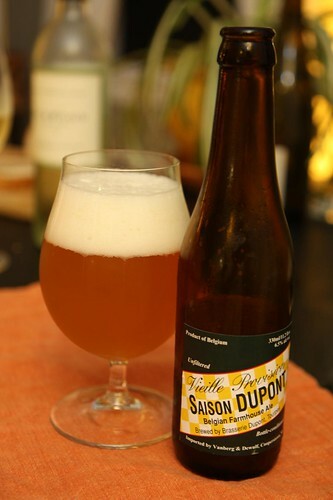 so it was that I decided to have this farmhouse ale, Vieille Provision Saison, by Brasserie Dupont. It actually worked very well. It reminded me a bit, in an odd way, of the Penny Weiz I had the other night. 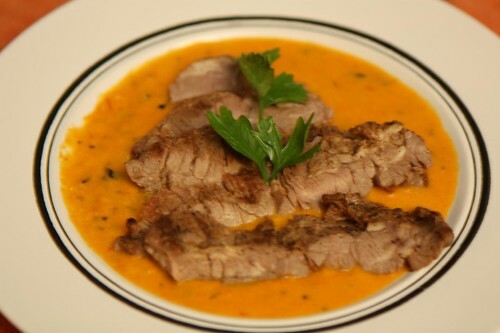 It had a crispy, acidic white wine type flavor that actually paired well with eggs and tomato, two items that one doesn't typically think of when pairing food with beer. Then again, my food and beer pairing skills generally only include two factors: a beer I like and a food I like. It seemed weird to only have shakshuka so I also made this dish with the leftover grilled skirt steak from the other night and I put it on top of this hot tomato, peach, and basil sauce which had previously been a tomato, peach, and basil ice cream which had previously been a chilled tomato, peach, and basil soup. I think I finally found a use for this after three tries. It needs to be served hot! 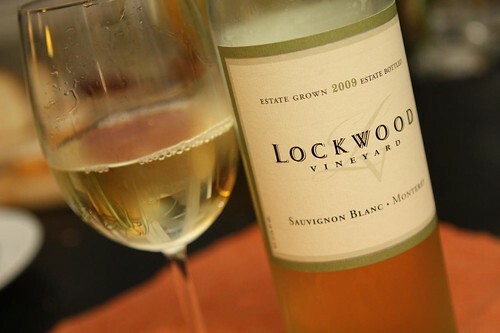 This 2009 sauvignon blanc from Lockwood Vineyard went nicely with the grilled steak and sauce. I think we had too much bread tonight. Between the two of us we polished off most of a giant loaf of Italian bread mopping up sauces left and right. I think the ideal dinner results in using up a giant loaf of bread to mop up sauces. What could be better than that? Now, it's time to settle in and have a nice private viewing of Shaq Shuka! That movie never got the credit it deserved.